Real-time data extraction is the process of extracting hidden and valuable information from large databases. This extracted information is then used for making important business decisions leading to improved business intelligence, database marketing or reports generation. Some real-time data extraction software predict future trends and behaviors automatically. 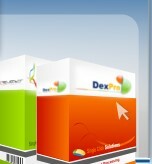 DexPro real-time data extraction software is ideal for database marketing. You can easily drag & drop data extraction and processing from multiple databases. It can be easily configured. It enables you to combine data gathered from multiple databases and also facilitates data extraction. This is not all, it allows for report generation, mail merge, email broadcast and monitor replies too. Real-time data replicators applications on the other hand provide data protection and retrieval features to keep data safe and secure in disastrous situations. Real-time data replicators enable continuous and effective business services. The real-time data replicators can replicate data across multiple servers. In case the primary server fails, users can be connected to standby servers reducing downtime to minimum. Real-time data replicators are security-enhanced backup or disaster recovery software. If you are looking for real time data replicators for secured backup and disaster recovery, Single Click Solutions provides you with a suite of business applications. Our software solutions will provide you data wherever you want it and also protect your data from server or system failure, providing fast recovery. Effective replication of data : Real-time data replicators ensure effective duplication among primary and secondary backup, aiding your company to have comprehensive storage and recovery mechanisms. Better access of data : Real-time data replicators improve data access and provide up-to-date, replica of data on multiple servers allowing continuous availability of data. Cost effective : Real-time data replicators transfer only changes, such as addition, modification and deletion across a network, thereby lowering the cost of preserving synchronization among replicated databases.